Recently a team of All Progressive Grand Alliance (APGA) party members from the LGA thronged the state party secretariat in Awka, to lodge their complains about the level of insincerity on the part of the party LG chairman, Chief Vincent Ezenia and his sponsor, Chief Chike Odoji who they claimed have used them to achieved their selfish political gains. Some of the protesters who did not want to disclose their identity narrated that their protest action was an avenue to unearth some of the deceit they suffer from the local government party leadership, stating they have been used not only to suspend, remove and replace any party officer at the ward and local government level, which they leverage on to oblige the TC Chairman and his members of any party meetings or invitation, both collectively or individually as they were made to believe. Honourable Chike Odoji who double as Senior Special Assistance to governor Willie Obiano on Internally Generated Revenue (IGR) and Secretary APGA of Dunukofia Local government Area as against the discretion of the newly appointed Special Adviser to the governor on Political Matters, Barrister Ifeatu Obi-Okoye who relinquished his post as the national publicity secretary of the All Progressives Grand Alliance (APGA) in order to face the assignment as the political adviser to the governor.. The Dunukofia LG Party members sponsored for the protest said they were invited by Honurable Chike Odoji to the state party secretarial in Awka at the instance of Honourable Peter Ozumba, the state APGA youth leader, whose aims were to remove the council chairman for a easy ride to enforce their interest on intending candidates in the oncoming general election for both state house of assembly seat and that of the national assembly. The supporters further disclosed that they were instructed to gear up their agitation and mount more pressure for immediate removal of the Council chairman Honourable Uchenna Umerie, ‘’After several attempts and intent of allegation on the way and manners election materials were distributed which did not favour them, the chairman, haven warned and advised severally that the local government party exco is not in any way another electoral ward of its own, nothing that party exco from the national, state and LGAs all belong to a political ward, he urge them to go back to their different wards to join mobilization and to proffer winning ways, which they decline to’’. ‘’The party leadership in their ploy to ride on our intelligence employ the gimmicks of another deceitful invitation, asking them to come for a share of the proceeds realized from a cow donated by an aspirant, as they were further blackmailed that there is no protection in the solidarity visit to the state secretariat of APGA in Awka, which they were cajoled that money too would be shared alongside’’. The Protester revealed. Another sets of protesters who later shared a similar view that they were deceived into coming to Awka to spare about 30 minutes to one hour of their time to pay a visit on the party exco in solidarity, an action they later discovered that they would be asked to demand for the removal of the LG Chairman or carrying pal-cards, neither did they know that they will visit the house of Assembly, which they divulge to exonerate themselves from the gang-up. He explained. The protesters carrying pla-cards with inscription bearing; WE SAY NO TO SAPA, SAPA IS A BIG SCAM etc, urging the state party headquarters to investigate what they tag as high handedness and unruly behaviour of the LG party chairman, alleging their involvement in anti party activities; paying loyalty and exposing party activities to a billionaire indigene of Dunukofia LGA through his nephew, Prince Nonso Eze an aspirant for the LGA house Assembly seat. The protesters were received by the state APGA party Treasurer, Mr. Samuel Nwankile, alleging that the LGA party chairman Mr. Chief Vincent Ezenia and his sponsor Mr. Chike Odoji who doubled as the LG Party secretary and Senior Special Assistance to the governor on Internally Generated Revenue IGR’s demeanor of anti-party activities, gross misconduct and conspiracy. Nwankile admonished the youths to remain calm and ensure restraint is observed while the party investigates their allegations. Contrary to the first protesters’ view, a counter protest, by the All Progressive Grand Alliance Party chairman of Dunukofia LGA led another set of protesters to the state house of Assembly, carrying pla-cards with different inscriptions as well, reading: CHANGE HON. UCHENNA UMERIE TC CHAIRMAN, DUNUKOFIA, DUNUKOFIA DON’T WANT HON. UMERIE, PARTY IS SUPREME, PLS SAVE APGA DUNUKOFIA FROM DESTRUCTION etc, chanting war songs that the party is not safe under the leadership of the Transitional Committee chairman, Honourable Uchenna Umerie, if he remains as the Transition Committee Local government chairman of Dunukofie LGA. Though there was a mild fracture between the two groups who suddenly met at the same point of the Anambra state house of Assembly’s gate, seeking who would be heard first by the legislators to register their different complains. Speaking to journalists after their effort of being heard was thwarted, the embattled chairman of APGA in Dunukofia LGA, Honourable Chief Vincent Ezenia expressed disappointment at the conduct of the Transition committee chairman, who he claimed does not carry the party Excos along in the operations of the local government. He alleged further that the chairman, Honourable Umerie has since isolated the party exco from participating in Local government activities, said he runs the LG as his private enterprise without recourse to due process, accountability and due diligence to accommodate party officials in the LG operations. Responding to the protest, the lawmaker representing Dunukofia 1 state constituency, Honourable Lawrence Ezeudu told journalists that the LG party exco were on solidarity movement to visit him as their representative at the state house of Assembly. He said the TC chairman records sternly achievements that could instigate opposition to formulate negative reactions to discredit his works at the local government area. Honourbale Ezeudu maintained that the visit was never a protest as it was portrayed by many, he affirmed that the LGA is at peace with the party officials and said nothing would undermine the good works the governor is doing in all the LGAs and the state, adding that APGA remains the most peaceful party ever in operation in Nigeria. 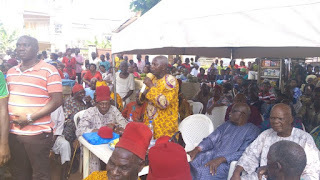 When contacted, the Transition Committee chairman of Dunukofia Local Government Area, Honourable Uchenna Umerie debunked the claims that the party structure in the LG is in shamble as he relates some of the programmes he has embarked upon to establish his claims, stating some of the responsibilities he engages the party exco to carry out as part of efforts to ensure APGA remains a formidable party in the LGA. He reiterated that his political achievements reflected more in the last governorship election that gave overwhelming victory for APGA to return Governor Willie Obiano to office in his second term bidding as the candidate of the party. 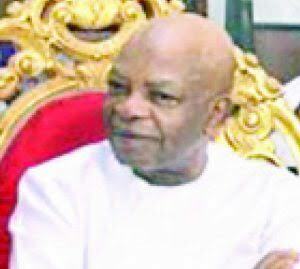 Umerie went further to distance self from the claim, insisting that the party is not in crisis in the local government area, saying though there were petitions written against him and he had appeared before the parties to set the records straight, all in the intent to ensure APGA remains undivided, not recourse to the allegation of Anti-Party conduct of the LG party chairman, Chief Vincent Ezenia and his sponsor Mr. Chike Odoji, who seems to be on the rise to undermine his achievements as the Transitional committee chairman of Dunukofia Local Government chairman. A source in the local government executive of the party who pleaded anonymity, revealed that the imbroglio broke out when Honoruable Uche Umerie was returned as the TC Chairman, against the interest of the party chairman and his Sponsor, who wanted to succeed Uchenna Umerie as the TC chairman after the November 18th, 2017 governorship election. 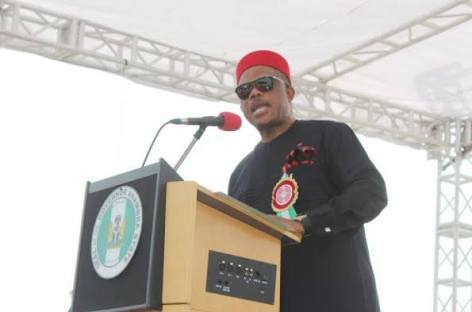 The source revealed that the LG party secretary though not satisfied with the position even as when governor Obiano appointed him as a Senior Special Assistance to the governor on IGR and retain his position as the party secretary in the LGA, said the SSA insisted on removing Honorurable Uche Umerie as the TC chairman to pave way for him to become the next LG chairman, as well as ensuring Prince Nonso Eze an aspirant for the state house of assembly seat gets the party ticket to thwart Honourable Barrister Lawrence Ezeudu’s chances of returning to the house as the member to represent DUNUKOFIA 1 LG at the state house of assembly come 2019. Another source close to the party exco in the LGA revealed that the LG chairman, Honourable Uchenna Umerie has never been invited to any meeting, also that the LG exco has not made any request from the LG chairman that the chairman turned down. He noted further that the LG party exco kept a distance between them and the LG chairman because they are still embittered about the chairman’s appointment as against Mr. Chike Odoji’s interest whom they have started addressing as council mayor even when the appointment was made by his Excellency. Another source further elucidated that Mr. Chike Odoji’s interest has been to become the Care-Taker chairman of Dunikofia, which he categories as failure on his part, as not been successful to be appointed as the TC chairman of Dunukofia LGA, hence his desperation . He stressed further that the money that both Honourable Peter Ozumba makes in Keke Internally Generated Revenue in the whole state and the money that Mr. Chike Odoji makes from parks and markets that was awarded to him are where they leverage on to have easy access to funds to perpetuate their evil ’’ As bargained with Peter Ozumba to foist Nonso Eze the nephew of the Ukpo born Billionaire on the LG as the next lawmaker for Dunukofia LG state constituency, stating that the duo have strategically wielded so much power to determine who-gets-what and when as far as Dunukofia LG is concerned. Some staff of the LG spoken with confirmed the alleged intimidation on the LG chairman by his party men, urged the state authority to caution Mr Chike Odoji and Honourable Peter Ozumba not to distract the LG chairman who according to them remains the best thing that ever happens to the Local governmeThe staf of the council also told journalist that they have not had it good with the type of leadership prowess they have in the person of Honourable Uchenna Umeria, who according to them created conducive environment between them and the communities, which resulted in the overwhelming victory APGA recorded in the just concluded Governorship election’’. Explaining further, ‘’if not for the good will he earned from the , the result of the governorship election may not have been that overwhelming as it turned out, they joined others teaming supporters to express their solidarity to the chairman of Dunukofia Local Government Area’’. . He said. 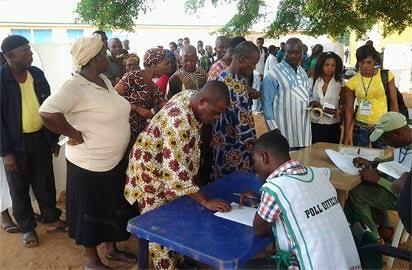 The state party executives and stalwarts are of the view that the party officials in Dunukofia local government should have collapsed their grievances and complaints, relate through the Local government chairman, who is the closets tier of government to hear their complaint, but felt disappointed that an individual would constitute self to an institution that every opportunity must come through him. Hope seems to be on the rise as the state party exco has vowed to nip the brewing crisis in the bud to ensure the peace the party was enjoying before the Governorship election is restored.